2. In a medium size skillet, fry bacon strips until crisp. Drain on paper towels until cool; crumble. Drain all but 1-2 Tbsp. fat in skillet. 3. In a small bowl, mix together eggs, milk, salt and pepper. Pour into skillet and scramble over medium heat until fluffy. 4. Place pizza shell on baking sheet or pizza stone. 5. 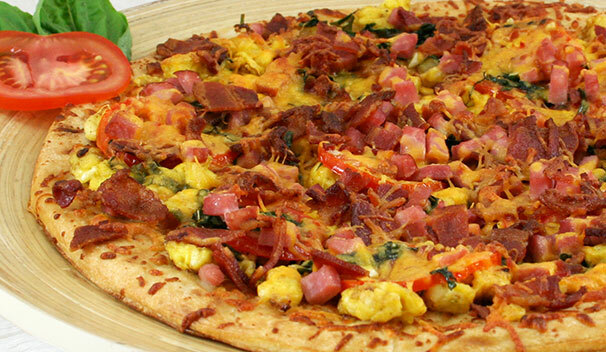 Spread scrambled eggs on pizza shell. 6. Combine tomatoes, basil, olive oil, and garlic in a small bowl. Toss gently, then spread evenly over eggs. 7. Top with crumbled bacon, and diced ham. Sprinkle the shredded cheddar cheese evenly over top. 8. Bake for 15-20 minutes at 425° or until hot and cheese is melted.